If R. Kelly went deaf, he'd surely want one of these. 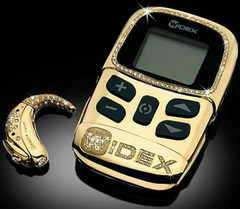 Numerous blogs are buzzing about a new gold-plated, diamond-encrusted hearing aid and wireless remote from Widex that's available for $50,000. Great post, thanks for the information. i had loss of 60% hearing on both side since childhood. Some of us can't afford to buy an hearing aid. So I am glad that there are some people who started to build foundation that can donate a used hearing device. That was very useful. A $50,000 Hearing Aid! That's a big no for me. Please encourage the future of iphone to be made properly! I really like them and really want one but I wear hearing aids too. Ive tried using an i phone and it does not work. This is one expensive hearing aid! It does not have to be that expensive. What is important is that it can help you live normally. Sooooooo expensive :). This new technology is amazing and really does ensure that those of us who are hearing impaired don’t have to take a backseat to technology. Your site is very good. There are useful information and most importantly, for sharing great. you have posted such a effectful article that it will certainly help me. I certainly enjoyed the way you explore your experience and knowledge of the subject! Great post, I am really enjoying the process & journey your taking us on. Very inportant notes I recommended this to all my friends. A great post, thanks for taking the time to share, continued success to your site in the future! GOOD Work! A great post, thanks for taking the time to share, continued success to your site in the future! GOOD Work! !